Vico Magistretti (b. 1920), Italy. Vico Magistretti (October 6, 1920 - September 19, 2006) was one of Italy's most influential industrial designer, known as a furniture designer and architect and primarily for his iconic modern furniture and lighting designs for Artemide. In 1920 Vico Magistretti was born in Milan, the city in which he graduated in architecture in 1945, and where his professional career has spun its story ever since, chiefly in the fields of architecture, town planning and industrial design. The first recognition of his work came in 1948, when he won the Gran Premio at the 8th Triennale. After that came almost forty years of activity with other prizes and awards in recognition of Magistretti's work in various sectors in different countries. Giving lessons and lectures in various faculties of architecture and schools of design in Italy and abroad, from Milan to New York, from Paris to London, a city to which he is particularly devoted, he has been an “Honorary Fellow” of the Royal College of Art since 1983. Furniture, lamps and other objects that he designed may be found all over the world and the most important design museums have given exhibitions in his honour and kept examples of his work in their permanent collections. Vico Magistretti's research has been continuous - into design, the culture of the project and innovative experimentation with materials and space solutions, not to mention shapes and functions far from the rigours of fashion that they have passed through during the years. He started designing for Cassina in 1960, and from that date on his signature is to be found on very many products. We recall in particular the Maralunga sofa of 1973 and the Nuvola Rossa (1977) bookcase, which are still indisputable international best-sellers and have provoked hordes of imitations which have not been able to echo even faintly the success of the originals. No matter what materials were used, Magistretti always attached great importance to high quality workmanship. For a design solution to be long-lasting and of high quality, Vico Magistretti felt it had to be both beautiful and useful. His designs invariably link sculptural elegance with technical sophistication. From the 1960s Vico Magistretti designed furniture and objects of plastic. His "Telegono" table lamp dates from 1968. Magistretti created "Selene" (1969; for Artemide), a plastic stackable chair moulded in one piece. The Magistretti chairs "Gaudì" and "Vicario" were designed in 1970. 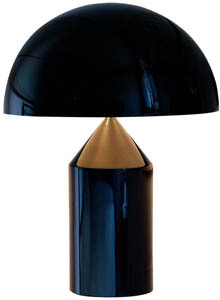 In 1977 Vico Magistretti created "Atollo", a metal table lamp. In 1983 he designed "Veranda", a convertible sofa that is equipped with an adjustable headrest. Vico Magistretti is famous for his Selene Chair, Gaudi Chair, Maralunga Sofa, Atollo Lamp, Eclisse Lamp, Mezzachimera and Chimera lamps. Among his most important architectural work in Milan during this period we can cite the Torre al Parco (1953-56), the Corso Europa office building (1955-57) and the Piazzale Aquilea building (1962-64). There followed a number of villas, including Arosio house in Arenzano (1958), Schubert villa in Ello (1960), Bassetti house in Azzate (1960) and Gardella house in Arenzano (1953). Finally, the apartment building at Piazza San Marco in Milan dates back to 1969-1971. His more recent work includes: the Milan Faculty of Biology (1978-81), Tanimoto house in Tokyo (1985) and the Famagosta Bus Depot in Milan (1989). A prolific designer, he won the price ''Compasso d'Oro'' in 1967 for the Artemide Eclisse lamp, in 1979 for the Oluce Atollo lamp and for the Cassina Maralunga sofa. He also produced designs for De Padova, Fritz Hansen, Campeggi, Fontana Arte, Fredericia and Kartell. Since 1967 he has been a member of the San Luca Academy and the London Royal College of Art, where he was also visiting professor. Shop Vico Magistretti lighting and furniture at Stardust & receive Free Shipping and a 110% Low Price Match Guarantee. Stardust; the best design shop in town™, buy modern home furnishings and designer lighting!